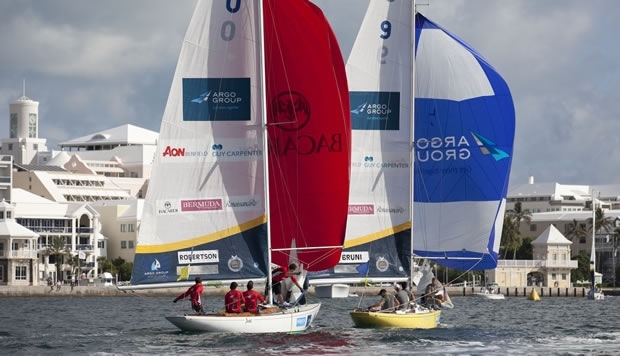 It was another tense day on Hamilton Harbour where the first-to-three Quarter Final matches of the Argo Group Gold Cup, the penultimate event of the Alpari World Match Racing Tour were being played out. With the wind having veered into the southwest, racing took place under a scorching sun in a shifty 7-10 knots of breeze. Francesco Bruni’s Luna Rossa team was the only one to go through 3-0, taking Phil Robertson’s WAKA Racing out of the competition. Sir Ben Ainslie’s Argo Group-backed team and Taylor Canfield’s USone both won their matches 3-1, respectively against Bjorn Hansen’s eWork Sailing Team and Ian Williams’ GAC Pindar. The only pairing to go the full nine yards was the Antipodean dust-up between Kiwi Adam Minoprio’s Team Alpari FX and Australian Keith Swinton’s Black Swan Racing, with Minoprio scraping through. Bruni added he was pleased that despite being a penalty down in the second race they had managed to extend away from their Kiwi opponent enough to carry out their turn. The Quarter Final shock was certainly Ian Williams, the current Alpari World Match Racing Tour leader, being dispatched by defending champion Taylor Canfield. Coming out on top in Qualifying yesterday, Williams had been able to choose his opponent for the Quarter Finals and had picked the US Virgin Islands sailor as he represented his most major threat in the overall points for the 2013 Alpari World Match Racing Tour. Sadly his choice back fired and after the pair drew level on 1-1, Canfield’s USone crew won the next two. While the wind was further right today, it has still been blowing off the land making it particularly tricky for the tacticians. But Canfield said that as an ex-College sailor, he liked these conditions. Another man experienced with going the right way in tricky conditions was Ben Ainslie’s triple Olympic medallist tactician, Iain Percy. The Team Manager for America’s Cup challenger Artemis Racing kept his cool today, helping Ainslie’s team win three straight after losing the first race to Bjorn Hansen’s team - not quite Oracle Team USA’s comeback, but good enough. Bjorn Hansen admitted that he and his crew didn’t sail their best today. They were particularly sad to lose the second race when they had been leading but were a penalty down and had tried to carry out their turn coming into the final top mark, only for a wind shift to prevent this. The British Olympic legend closed in on them, and there wasn’t enough runway to carry out their turn before the finish. “That was frustrating. They were just a bit better than us today,” said the Swedish skipper. Adam Minoprio, skipper of Team Alpari FX arrived back at the Royal Bermuda Yacht Club tired, but smiling. “It was a very long morning for us. Keith took it all the way to the wire, but it was good to get a win over him in the final race after all the smart-arse Aussie remarks he was making about us at the press conference last night!” he said. All their races were won in the pre-starts and once across the line it was a case of the rich getting richer. Minoprio said he was kicking himself for the two he lost. In one he got stuck in a slow tack on the start line, enabling Swinton to sail away from them while in the other he got his time on distance wrong and was simply late starting. The Semi-Finals are scheduled to start tomorrow at 1300, preceeded by the 5th-8th place series starting at 1000. At today's post-race press conference Sir Ben Ainslie chose to race Adam Minoprio, leaving Bruni to line up with Taylor Canfield.